20/9/12 - Acquisition - Bordeaux, Musée des Beaux-Arts - A Spanish painter influenced by late Italian Baroque art, Antonio González Velázquez spent part of his career in Rome alongside Corrado Giaquinto and produced a certain number of frescoes like the one on the vaulted ceiling of the Santissima Trinità degli Spagnoli in 1748. After returning home with some fame, he decorated the cupola of the Santa Capilla del Pilar in Saragossa in 1752, then was commissioned by King Ferdinand VI, in 1755, for the décor of the Convent of the Salesas Reales in Madrid, consecrated in 1757. The Musée des Beaux-Arts in Bordeaux recently acquired a modello from the Terrades Gallery related to this commission, entitled Apparition of the Virgin to Saint Ferdinand on view during the gallery exhibition highlighting Trois siècles de peintures espagnoles in November-December 2011 (see article in French). This is a study for the arch in the left transept of the church dedicated to Saint Ferdinand. The son of Alfonso IX of León and Berengaria of Castile, Ferdinand III was a cousin of Saint Louis and was also canonized in 1671 for having turned back the Arabs ; a prominent figure in the Reconquista, he also embodied the union between the two kingdoms of Castile and Leon in 1230. González Velázquez evokes the siege of Seville undertaken by the king in 1247 to regain the city from the Muslim occupiers who surrendered in November 1248. In his study, he centered the composition on the apparition of the Virgin to Saint Ferdinand while the final fresco as well as a preparatory study held at the Prado in fact offer a broader image of the scene with, in the background at the left, soldiers in front of the city ramparts. Another version of the work came up for auction on 5 October 2005 at Christie’s (but remained unsold), dating from 1761. The artist displays his skill at foreshortening and magnifies the scene by presenting it "da sotto in su" ; the beautiful effect of red drapery accompanying the king’s gesture of surprise offers a striking difference with the yellow emphasizing the legs extended by the angel with outspread wings. The figure of Mary, however, is in contrast with the other two : standing on a cushion, she is more static and, above all, much smaller. In fact, this is not an apparition of the Virgin but rather of a statue. Perhaps this is even the "Virgen de los Reyes" [Our Lady of the Kings], a sculpture still standing today in the royal chapel inside the cathedral of Seville and where Ferdinand III lies in a reliquary at its feet. This casket is enveloped in various legends claiming it was created by angels, that it was given by Saint Louis to his cousin, or that King Ferdinand saw it in a dream and had an identical one made, keeping it with him wherever he went. The group of angels is close to the one shown in Christopher Columbus Offering the New World to the Catholic Kings, for which the museum in Quimper holds a study and where we can also see the motif of the step. 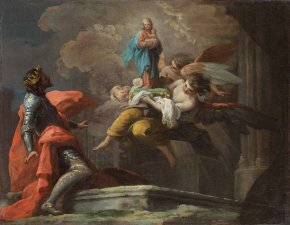 In addition, the work recalls other productions by Giaquinto, notably Aeneas Offering a Sacrifice to Apollo, a composition in which the hero adopts a pose similar to Saint Ferdinand’s, while the Museo San Martino in Naples holds a drawing of an angel close to the one found here. Antonio González Velázquez was appointed court painter in 1757 and became director of the Academia de San Fernando in 1787.